Never fancy, always a favorite, the Seattle spaghetti institution closes forever on Dec. 23 after 46 years, making way for a developer. 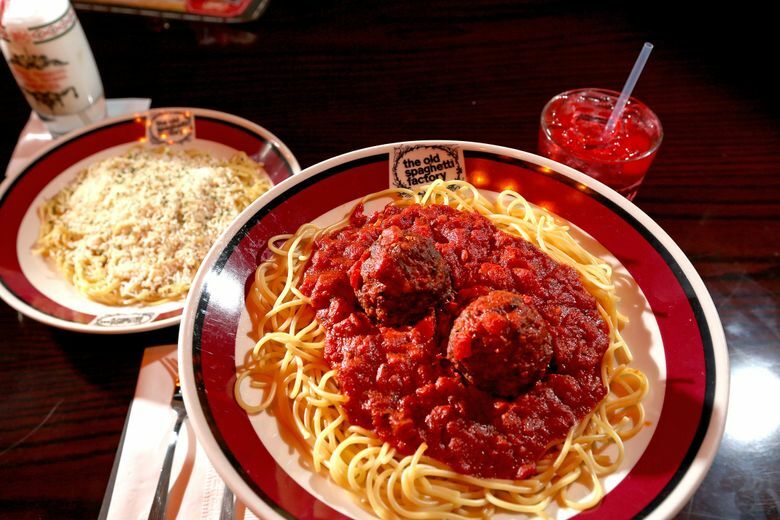 If you grew up in Seattle, the Old Spaghetti Factory down by the waterfront probably has a special place in your heart. Trying to demolish a plate of the signature spaghetti with mizithra cheese there — that’s after the warm loaf of sourdough with whipped butter, after the iceberg lettuce salad, and before the spumoni, all included with every entree — is accompanied by intermittent birthday choruses and bursts of cheering in the distance. Kids ride through the labyrinthine dining room on grandpas’ shoulders, their heads only a little closer to the massive timber beams of the 1902 building. First dates cautiously twirl noodles. 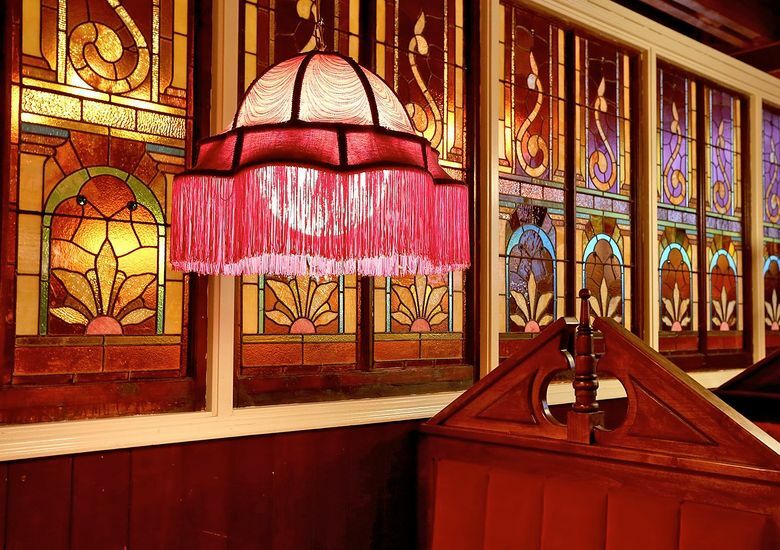 The décor runs to bordello-style fringed lampshades and interest-defying reproduction period artwork, with a full-size, old-timey trolley car as the crowning glory. You might get a table inside it, if you’re lucky. 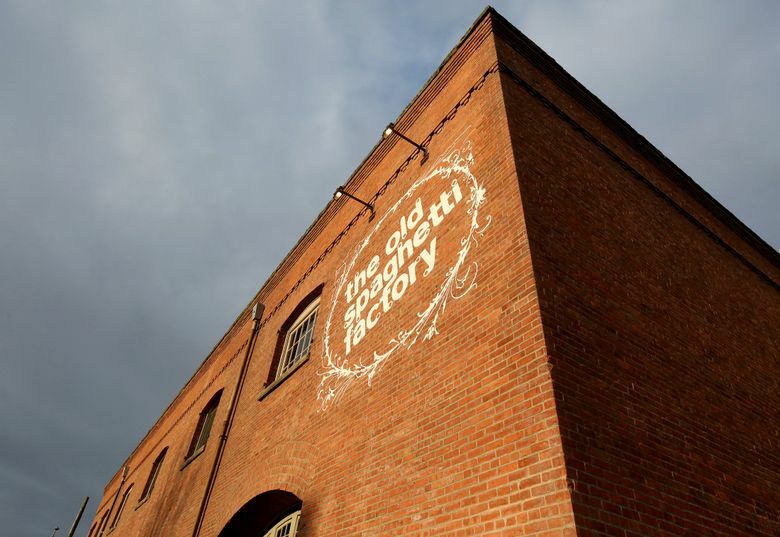 I had my first real cocktail at the Old Spaghetti Factory — or so I thought. I was about 5, waiting for a table with my family; you always wait, as they don’t take reservations. A server came by and offered my parents a drink, then courteously turned to me: Would I like anything? Might he recommend a Shirley Temple? Yes, thank you very much, though I’d never heard of such a thing. When it was in hand, I had no notion that it was anything less than the height of sophistication, and a lifetime love of dining out began (as well as an undying belief in the cocktail hour). Service like this — the kind that makes a small child feel importantly stylish, in a way they remember forever — is one of the reasons people love the place. Since the announcement of the impending closure, the Old Spaghetti Factory’s been busier than ever. According to one server, the place seats around 400 people, and they’d had up to 300 waiting; on weekends, they’ve been serving around 1,600 people a night. Another server jovially mentioned that he’d opened so many bottles of wine in recent weeks, his corkscrew had just suddenly fallen apart. Last Saturday night, a group of former employees gathered for a last supper. Former server (and janitor, and busboy, and barback, and host) Pete Hanning, who now owns Fremont’s Red Door, recalled a less-than-graceful moment in which he fell down with a full tray inside the streetcar. His pinkie still has a scar. He said some members of the group — 20-plus strong, having worked together in the 1980s, when most were in college or newly graduated — once took a four-top’s worth of silverware out to the waterfront train tracks. They lined them up along the rails, watched them get flattened, then reset the table with the comically stretched, oversized cutlery for a company inspection. The owners of the chain didn’t notice. Hanning pointed out Lawrence White across the big table; they were roommates back in the day. White teaches writing at Tacoma Community College now, and Hanning credits him for his own lifelong love of poetry. White met his wife working at Spag (the workers’ nickname, at least at the time) and averred that, just among people he knew, 15 more couples had done likewise. Another kind of Old Spaghetti Factory family also had a farewell gathering last weekend: a group of 20-plus Lake Washington High School alums who had been meeting every December there since 1972. “And we still like each other!” one quipped. They originally chose it out of thrift (it’s never been a fancy place), and because despite the no-reservations policy, big groups were easily accommodated (after a few drinks in the bar). There’s no Facebook invitation or anything, Bruce Addison said; “You just know to show up” the Friday before Christmas. That’ll be the Old Spaghetti Factory’s chaotic last day this year, so they’d moved it one Friday prior; still, no one had ever seen it this crowded. Their dinner included much good-natured teasing, with targeted skirmishes of food-fighting (bread only, no meatballs). Every year, someone says it’s their birthday; a herd of staff comes to sing, and that person gets a free dessert in addition to the spumoni. Solemn moments occurred among the fun — Steve Anderson, the original organizer, had recently passed away. His wife and classmate, Cindy, persevered, albeit a little tearily at times. The annual reunion would continue, all vowed, though the future venue was a source of debate. The branch of the Old Spaghetti Factory in Lynnwood wouldn’t be the same, but it might have to do. Bethany Jean Clement:bclement@seattletimes.com or 206-464-2050. On Twitter @BJeanClement.